Spray an 8×8 or 9×9 pan generously with non-stick spray, or line it with foil. Make sure that you go up the sides with your foil as well. I would highly suggest using foil it makes it so easy to take out the fudge! In a large saucepan, combine all chocolate chips, add 3/4 can of sweetened condensed milk (just eye ball it) over medium-low heat (about 10-15 minutes). Stir constantly until smooth. Remove from heat and add vanilla, stir. Add marshmallow cream, stir vigorously until smooth. You may have to return it to low heat for a minute or two, to get it completely smooth again. Turn off heat. If it become slightly stiff, its okay it will still taste just fine. Press 1/2 of the mixture into prepared pan, doesn’t have to be exact. Leave the remaining 1/2 of your chocolate in the saucepan on your warm stove do not place on the burner you were just using it will burn the chocolate. Sprinkle pecans evenly across the top of your chocolate, lightly press pecans into fudge using the bottom of another 8×8 or 9×9 pan. 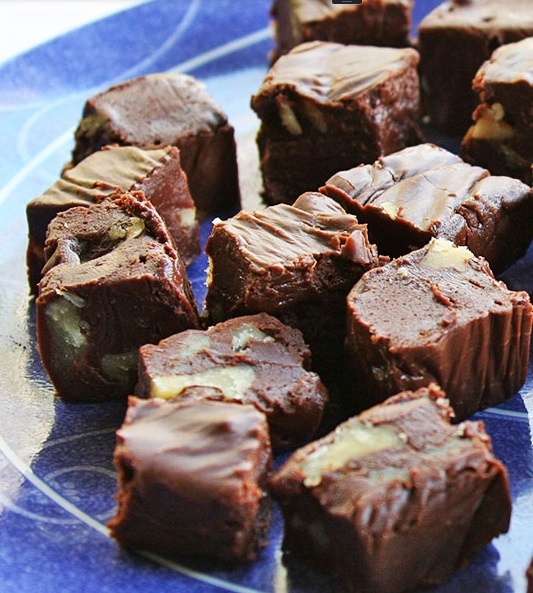 Don’t press them too far in, you want to see them later when you cut your fudge. 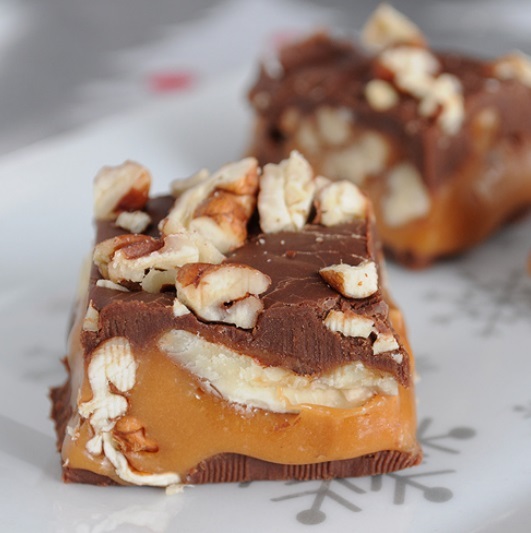 NOTE: You only want only a single layer of pecans, if you double them up, the fudge won’t hold together. Place pan in refrigerator (or freezer) to set up. About 10-15 minutes. In a medium-sized saucepan, combine unwrapped caramels and the rest of your sweetened condensed milk, (1/4 can). Heat on low and stir until melted and smooth. 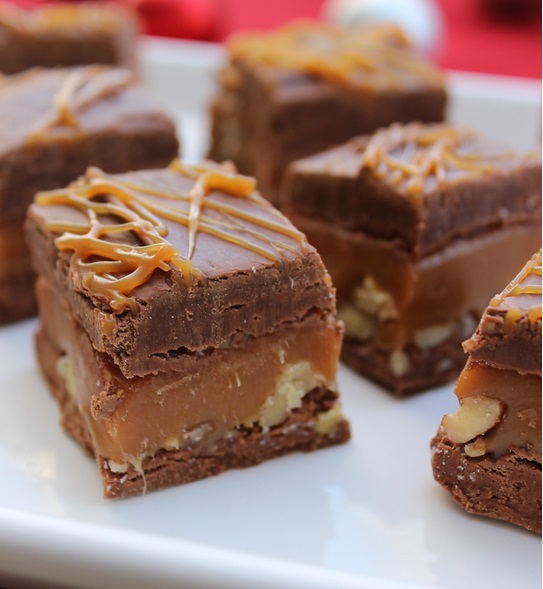 Pour all but 2 tablespoons of the caramel evenly over fudge layer. Reserve 2 tablespoons for drizzling later. Place in refrigerator or freezer for 15 minutes to set up. Re-heat reserved 1/2 of your chocolate and stir until smooth again. Press and spread over caramel layer. Place in fridge or freezer to set for 5 minutes. 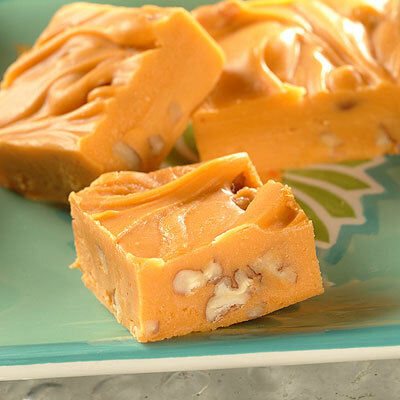 Re-melt your leftover caramel on the stove and drizzle it over the top of your fudge. Refrigerate for at least 2 hours before cutting, slice into even squares and devour immediately. 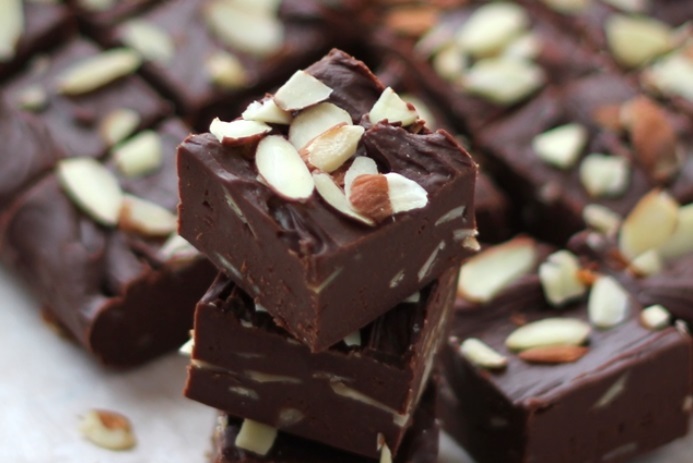 *If you are having a hard time cutting the fudge after removing it from the refrigerator let it set at room temperature for 10-15 minutes and then cut. 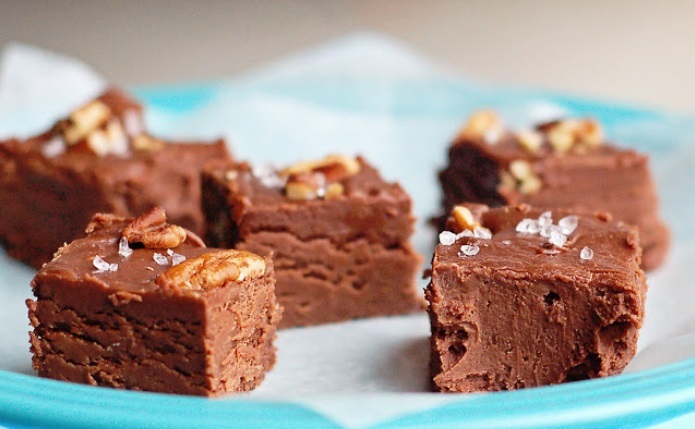 Notes : This chocolate part of this fudge recipe is not smooth like a the caramel layer. It is a little more thick, and you will need to press this in the pan. Once you have made it a few times, it gets smoother. But until then it still is amazing, even if it isn’t as smooth as you think. Just finish it, you won’t be disappointed. Line an 8×8 inch pan with parchment paper, leaving an overhang on both sides. Set aside. Place the caramels and water in a microwave safe bowl. On a double boiler, melt chocolate chips with sweetened condensed milk; add vanilla. When the fudge mixture is about to be ready (chocolate almost melted), place the bowl of caramels in the microwave and heat on high for a total of 3 minutes. Stir after each minute interval. Once melted, stir in pecans. Set aside. Pour half of the fudge into prepared pan. Spoon the caramel pecan mixture over the fudge. Spoon remaining fudge over the top (reheat if necessary). Chill in refrigerator until firm, about 2 hours. 1 Prepare everything in advance and have ready to go – chopped chocolate, chopped nuts, best to have marshmallow cream already out of the jar and in a bowl that you can easily scrape out with a rubber spatula. Line a 13″x9″x2″ baking pan with foil, butter the inside (alternatively, line the pan with waxed paper). 2 In a 3-quart, thick-bottomed saucepan, bring sugar, butter, and milk to a rolling boil on medium heat, stirring constantly once the mixture begins to bubble. Once the mixture reaches a boil, set your timer to 4 minutes. You will want to remove the mixture from the heat once it reaches 234°F on a candy thermometer (234°F at sea-level, adjust for altitude) which should take about 4 minutes. If you don’t have a candy thermometer, just go with the four minutes. 3 Remove from heat. Quickly stir in chocolate and marshmallow cream. Once those have melted and are well mixed, stir in the vanilla and then the walnuts. 4 Pour into prepared pan. 5 Cool to room temperature before slicing (about 4 hours). You may want to chill in the refrigerator to get it more firm. Coat an 8- X 8-inch pan with cooking spray or oil. In a medium saucepan, stir together sugar, evaporated milk and butter. Bring to a boil over high heat, then reduce heat to medium-low and cook, stirring constantly, about 3 minutes. Pour mixture into prepared pan, top with a handful of chopped pecan and a bit of coarsely ground sea salt if you wish and refrigerate until firm. (about 2 hours.) Cut into thirty-six squares and serve.